Studio City – O Hei There! I believe there is a general consensus that Daikokuya, Santouka, and Shin-Sen-Gumi are the top 3 ramen places in LA, and probably in that order according to popularity (certainly not according to taste, at least in my opinion). But last year, Jonathan Gold threw a new name in the ring – Ramen Jinya in Studio City. Gold named their tonkotsu ramen as one of his 10 favorite dishes of 2010, as well as putting the restaurant on his 99 Essential Restaurants list (Rameniac, a famed ramen blogger, shares Gold’s sentiments). 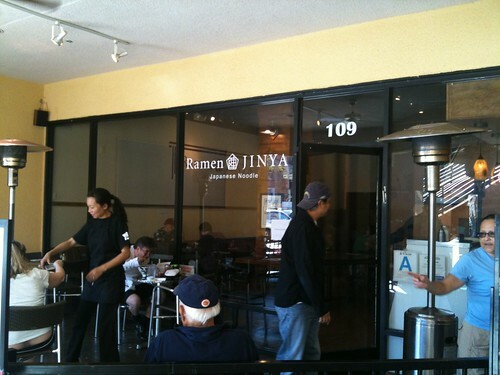 Looking for a place in the area to grab a quick bite today after going to the Forest Lawn in Hollywood Hills, Ramen Jinya was the clear choice. It wasn’t as if I was going to visit the likes of Asanebo and Sushi Nozawa for a random Saturday lunch. The restaurant is located in a strip mall on Ventura that is dominated by a Marshall’s. When I arrived at the restaurant around noon, there were a couple of tables and another person at the counter, where I sat. But by the time I left about an hour later, the place had filled up quite a bit. The ambiance is quite nice, considering it being a ramen shop. And the servers were extremely attentive during my lunch. I ordered the shio ramen ($9.55), which I read online that they only have 20 servings of a day (but that wasn’t noted in the restaurant), and added some gyozas and a salad to make it a combo ($13.50). The salad was nothing noteworthy, but wasn’t a detriment to the meal. 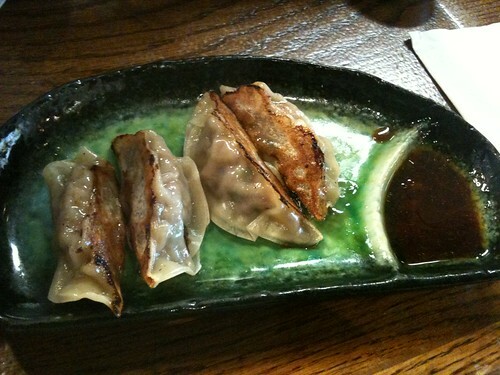 But the gyozas were a pleasant surprise – better than the ones at Daikokuya in my opinion. Now to the ramen: after some careful deliberation, I think that the ramen at Ramen Jinya is about equal to the one at Santouka, which is saying a lot, since I gave Santouka an A-. Taking a page out of Rameniac’s book, let’s take a side-by-side look at the shio ramen of Ramen Jinya and Santouka. Soup – Santouka’s broth has more pork flavor, and has more oil in it (which I love), but Jinya’s has a more distinct seafood flavor in addition to the pork flavor. If I had to choose, I think I might still go with Santouka’s broth, but Jinya’s is in the same league. Noodles – The noodles at Santouka are a bit thicker and curlier than the standard ramen noodles, but they’re usually cooked very well al dente. 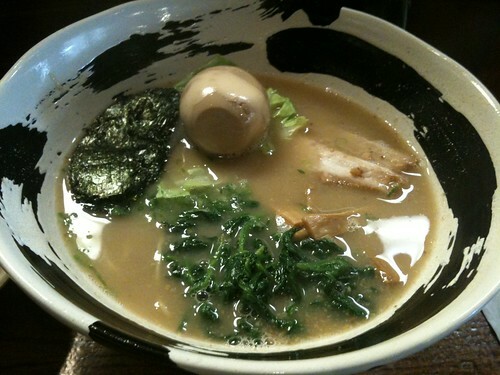 However, the thin strands at Jinya just seem to soak up the broth better, while maintaining a nice, firm texture. 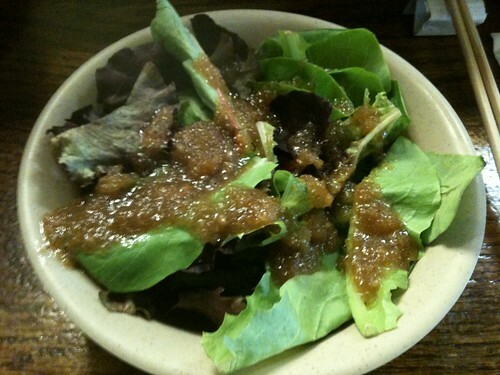 Toppings – Both places have a nice variety of toppings that go very well with the ramen. The chashu at Santouka is fatty and meaty at the same time, while the one at Jinya takes on more of a pork belly form and just melts in your mouth. While not included (but free with a Yelp check-in), the hanjuku (half-cooked) egg was full of flavor. 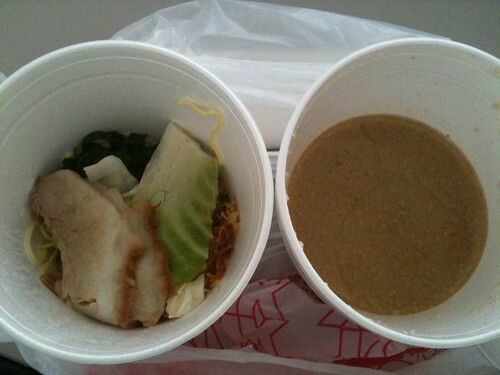 I also ordered a shoyu ramen ($8.55) to-go for dinner, which I’m currently eating as I write this post. It’s very good as well, almost on par with the shio. If I really had to choose, Santouka wins by a nose. But it’s damn close. I just wish Ramen Jinya was closer (although I heard the ramen at Robata Jinya in West LA is supposedly the same), because it’s somewhere I would go on a weekly basis – Santouka-quality ramen in an actual restaurant setting!